Lots of developers like using Stripe for projects becuase of its robust API (application program interfacing.) It’s a simple system to use and gives you the capability to build your own payment forms that can bypass PCI (payment card industry) requirements. Essentially, you don’t have to be compliant yourself because Stripe is already PCI compliant. Authorize.net is a payment gateway provider that has been around since 1996. Authorize.net’s pricing is slightly higher than third-party processors because it comes bundled with features, such as advanced fraud detection, recurring billing, eCheck processing and more. Authorize.net is not a Merchant provider which means they utilize an outside service to process transactions. PayPal is one of the world’s most widely used payment systems and processes approximately $8 million in payments every day. PayPal has over 169 million customers in 193 markets and 26 currencies around the world, which makes it easy to transfer and request payments. Paypal is very suitable for low-volume sales, at a budget-friendly price. 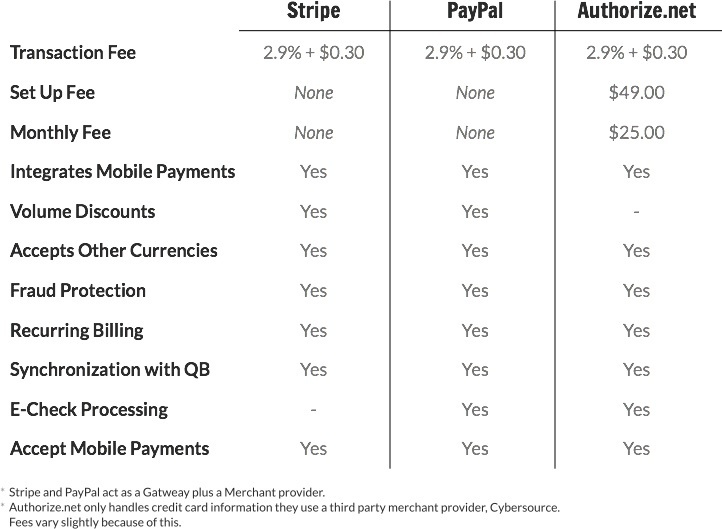 One of the big differences between Stripe, PayPal, and Authorize.net is that Stripe and Paypal act as a gateway and a merchant provider. Authorize.net only handles credit card information through a third party merchant provider, Cybersource, to process transactions. Making any business decision can be difficult. Choosing an online payment system is one of those hard decisions. The choices are endless, so make sure to do your research and make a well-informed decision. Whether you choose, Stripe, PayPal, or Authorize.net, your business will have a great system to utilize and the transactions process will be seemless.